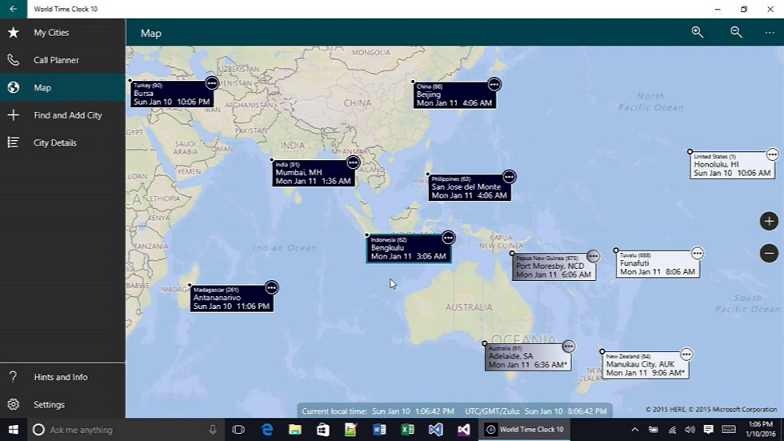 World Time Clock app is now available for free for next 5 days at Windows Store. World Time Clock app supports live start screen tiles. You can coordinate calls with your friends and business contacts around the globe using World Time Clock. Easily see simultaneous times in the cities you are interested in for the current time and future times/dates. Simple to use. More functionality for planning calls. You don’t even have to open the app to check the current time in the places that are most relevant to you. With a glance at the live start screen or start menu tiles, you can see the time for up to ten cites of your choosing. Choose your own cities, without having to wade through long lists of places you don’t care about. You can add cities that are important to your list of favorites. World Time Clock app straightforward Call Planner gives you an easy-to-read chart of simultaneous times in cities you choose – for right now and for upcoming times/dates. We provide not only times but also international/country calling codes. Calling a small town that isn’t in the built-in database? No problem. Just click on the map to find the nearest city in the region of interest.